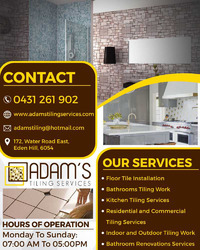 Adam’s Tiling Services provides easier installation of tiles for flooring. The company is nestled in Perth and has plenty of loyal customers. They offer residential and commercial tiling services to beautify the floors and provide a customised design and look. The company is also known as flooring expert because the experts use their experience and excellence for bathroom and kitchen tiling services. The company’s website has lots of details about the bathroom tiling and renovations services, therefore, visit the site and get in touch with them. Method of Payments: VISA/MASTER, Amex, Discover, Cheque, Cash, Bank Transfer/EFT. Hours of operation: Monday To Sunday: 07:00 AM To 05:00 PM.